Teaching geeks - what a challenge! Somehow we need to make it work. We are called to be the best home educators we can be for our beloved nerds. If you have a geek or nerd on your hands, other parents are likely jealous of your child’s math ability or at what a whiz they are with computers. They are amazed you can successfully teach math or computer science at home. If only they knew you were just hanging on by a thread! Together we can figure out how to get this job done. Parents of geeks and nerds, unite! When you think about it, now is a great time to be a geek or nerd. They can find like-minded people on TV shows and movies dedicated to geeks and nerds. The four pillars of geekiness are STEM; Science, Technology, Engineering and Math. These core competencies are hot topics, as most people today believe they are vital fields for the future. Often these interests will earn big scholarships and financially lucrative careers. Don’t you wish there was a user’s manual for these kids? They can be as difficult to decipher as a Java manual written in Mandarin! Let me make it simple for you. First, understand that geeks will be both awesome and annoying, so accept both. Second, do as much as you can to feed the beast and fuel those passions in your children. Third, watch for warning signs that could indicate trouble finding a balance in their love for technology. Fourth, be ready to collect the credits they accumulate naturally. Teaching geeks can be awe-inspiring as we watch them love and learn advanced subjects and technology that we can't even dream of understanding. They seem to learn beyond limits and absorb information the way we absorb the sun's rays on a summer day. I've spent many days reading “fluff” literature while my child was knee-deep in nerdiness. If you’re not a geek or nerd yourself, you have to wonder how they do it. How can they learn such remarkably boring and uninteresting stuff? It’s not boring or uninteresting to them. For some geeky reason only they understand, they love it! But geekiness has a down-side. It can be incredibly annoying. The sounds they make as they chatter away in their tech talk, and the discussions they have (or try to have) with others can be frustrating for parents. They can far-surpass our understanding of technology or other topics, leaving us mere mortals feeling incompetent and inept. But take heart! Annoyance can often mean real learning has taken place, and high school credit can be granted. Even though you feel like you are in over your head, you aren't supposed to be "teaching" at this level anyway. They are supposed to be learning independently, so it's not necessary for you to understand them. This is where the rubber meets the road - where they begin to take their own path. Tech-loving geeks can be like starving teenagers. It's a challenge to feed the beast and keep them satisfied! Provide the curriculum they need. Try to find hands-on experiences with like-minded geeks. Locate clubs, groups, fairs, and competitions that will interest your child. Techie teens can enter competitions, and enjoy the experience and a chance to interact with others who have similar interests. Competitions like these look great on a homeschool high school transcript. They can be listed on their activity list, demonstrating social skills and passion. Leading a group in their interest will indicate leadership skills. Using their skills on the job can earn money for college. For tech-lovers, check out First Lego League and the Lego Robotics League. Look into the USA Computing Olympiad, Science Olympiad, and other local science fairs and math competitions. If your child earns a certificate for Ham Radio or Java, include it on their transcript. At some point, you will need to go beyond the basics in science, technology, engineering or math. If your child is ready to go beyond high school basics in technical subjects, don't shy away, dive right in! There are plenty of resources online. Check out Khan Academy for high school level courses. If your child is ready for college level classes, you can look into Coursera.org or MIT OpenCourseWare. Don't worry - you don't need to know the material or even teach it! Find opportunities for your child to learn on their own. Geeks and nerds will enjoy learning across the curriculum with their passions. The topic that is their obsession can even be incorporated into subjects such as English, history, and art. Have them read and study books on the topic, write essays or stories, look for historical parallels, and create works of art or a short film. Give them credit towards each subject their work touches on! Beware of missing subjects. Plan early for college prep classes, because your child is more likely to want or require a college degree. Your geeks and nerds are going to need to cover all the bases required to enter college. They need to cover the major branches of science, not just the one they like most, studying biology, chemistry, and physics. Computer geeks will need calculus as well. In general, the more science and math they get in high school, the better, because they’ll need it for an engineering or computer science degree. At the same time, don't double up on classes by making them take a class in something when they already know the subject. Cover all the core classes. To get into a STEM program, kids can't study STEM subjects exclusively; they will need the other core classes. Include English, reading and writing, every year. They may enjoy reading classic literature that includes titles in the fantasy or sci-fi genre. Consider these books to add to your child's reading list: Alas Babylon, War of the Worlds, Brave New World, The Lord of the Rings, and A Wrinkle in Time. Cover the fine arts, too, perhaps in a geek-friendly way, with a subject like digital photography. Make sure you complete a foreign language. They may enjoy Latin because it's more logical than other languages, so check to see if that is an acceptable language to colleges you are considering. Be sure to include PE, so you can demonstrate a well-rounded individual. Watch out for the pitfalls of technology. Computer geeks do a lot of their work in various digital formats. Because being a geek or nerd tends to involve excessive computer use, make sure you and your child are both familiar with the signs and symptoms of internet addiction. Set reasonable boundaries, and teach your child the importance of monitoring their own computer use. You can find a collection of helpful articles on my Pinterest Internet Addiction Resources board. Discuss the appropriate use of technology together with your teen and set logical boundaries with the help of my article, TechnoLogic: Setting Logical Boundaries on Technology with Your Teen. Allow natural learning. If your child is learning math without you (don’t laugh – it can happen!) you don’t need to teach it again. Give your child a placement test in math to determine their math level. Fill in any math gaps with SAT Prep Books such as The Princeton Review’s Practice Tests for the SAT. These prep books can be used as math "worksheets" to cover any missing links. This way you will fill gaps and study for the SAT at the same time, so it's a win-win situation. They are especially useful for kids who have excelled in math and need a review in basic concepts in order to score well on the test and get into the geeky college of their choice. Encourage delight directed learning. 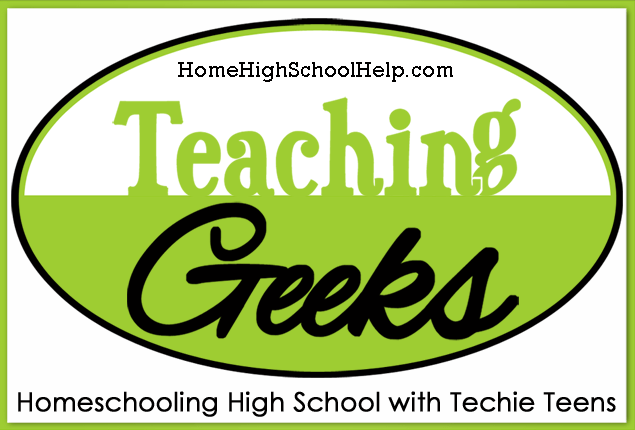 Use their geeky or nerdy pursuits for high quality electives. Your child may be learning computer languages or other highly technical skills that are typically studied in community college or university. If your child demonstrates mastery in a technical subject, give them credit on their high school transcript. For example, if they are fluent in C++, you might give 1 credit with the class title, "Computer Programming: C++." If your child is participating in robotics competitions, you can award 1 credit and call it "Robotics" or "Introduction to Robotic Engineering." If your child is an intern, use that experience as their Occupational Education credit. This is another class your child can include on the transcript every year (some classes may repeat every year). Collect college credits when you can. Sometimes learning goes beyond the normal high school subjects. While there are a few AP and CLEP tests in technical categories, more techie subjects can be found in DSST tests. These tests make wonderful outside documentation for highly technical skills and your child can get Two for the Price of One: high school credit AND college credit through one test! Just remember to check if the colleges your child is considering award college credit for these tests. Describe each class with detailed course descriptions. Since geeks can do some crazy stuff, just writing "Technology" for the class title isn't enough. Describe exactly what your child did, learned, or experienced. Make a list of what they used and provide some indication of how you graded - just remember that you do not need to include tests in your grading criteria, because there are plenty of other ways to evaluate learning. Your average child may get to pre-calculus or calculus in high school using standard homeschool curriculum, but your geek may need much more math in order to feed the beast. There are free resources available for upper level math. Don't forget that library resources are always free. Ask your librarian about AP Calculus resources you can use. Find the Teaching Company course called “Calculus Made Clear” to provide a clear explanation of calculus concepts while encouraging a love for upper level math. Here are some free resources for math experts. Some are completely free or available for a free trial period. One of these resources may be just the encouragement your little Einstein needs right now! As you are guiding your geek, remember that the path to techie happiness often runs through college first. Even a child who is happy being on the Geek Squad now may later decide to become a computer engineer. Always be prepared for career shifts and make sure your child is prepared for college admission and scholarships. A love of all things techie is not enough to get into engineering school. They need the whole package - even math and the fluffy, artsy, human-based subjects. Educate yourself about college preparation with my book, The HomeScholar Guide to College Admission and Scholarships. Here is the bottom line: relax! Let your computer geek or math nerd learn what they can without you. Along with the usual homeschool classes, give them what they crave. Provide the opportunity and resources to pursue their own, delight directed learning, while you enjoy scooping up credits for their homeschool high school transcript. Below are resources that will match your learning style! Do you prefer the basics in a short eBook? Although they stress a lot of parents out, transcripts are just a one-page overview of your child’s academic record. Any student who plans to go to college needs a transcript, and even students who don’t have college plans will benefit from having a record of their high school courses. A homeschool transcript can demonstrate your student’s strengths, depth, and individuality. It can combine all the wonderful educational experiences of high school into one centralized location on paper. Need to underline and highlight information in a real book? 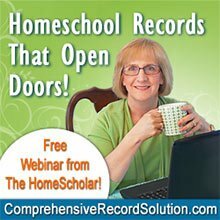 FREE Webinar: Homeschool Records that Open Doors! This article contains affiliate links. If you click through and buy, I may make a few pennies, but not enough to buy a latte. 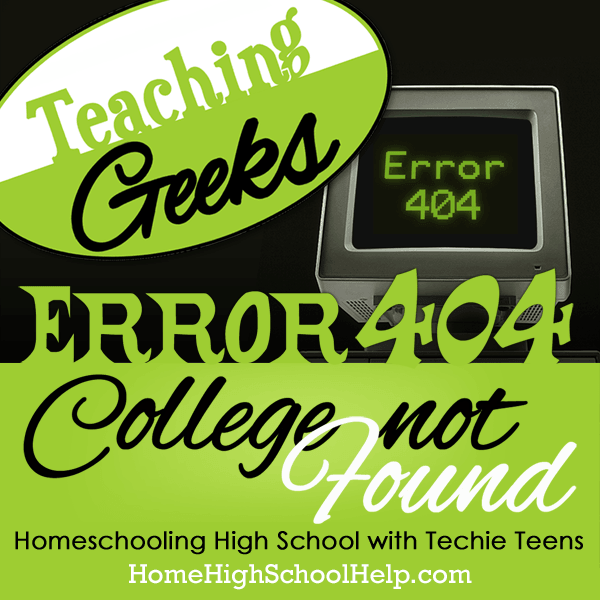 Copyright © 2014 The HomeScholar LLC, www.HomeHighSchoolHelp.com. Text may be reprinted without permission if used in full, except for use in a book or other publication for rent or for sale. 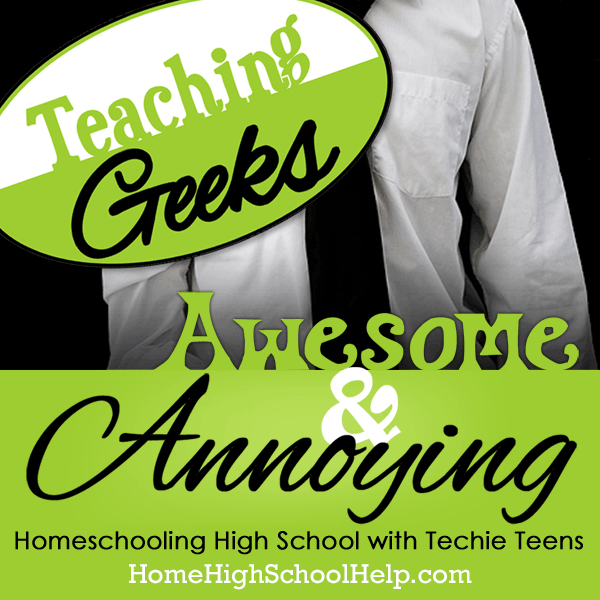 Reprint must include this copyright, bio (below), and the original URL link (https://HomeHighSchoolHelp.com/teaching-geeks).